“I’ve Been to Dwight,” is an off-year conference of the Alcohol and Drugs History Society, commemorating the fiftieth anniversary of the Leslie E. Keeley Company’s closure. 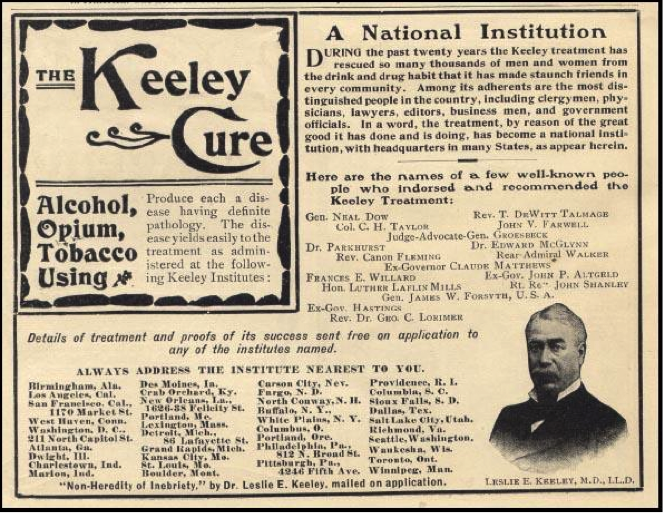 It will gather historians and social scientists at the site of the company’s former headquarters in Dwight, Illinois to present and discuss new research on the history of addiction, temperance and treatment in the nineteenth and twentieth centuries. The conference offers an opportunity to discuss these broad topics in a transnational, comparative, historical framework and will not limit participation to any particular psychoactive substance, habitual practice or region of study. We wish to encourage applications from scholars at all ranks, including graduate students, junior and senior faculty, archivists, collectors and historically minded treatment professionals. Applications for individual papers, full panels and/or table and poster displays are welcome.